Monday’s hot tip for aspiring tech journalists: when having a conversation with a booth representative, do not accidentally throw a multimillion-dollar prototype into your conference swag bag. In my defense, the prototype SSD drive was exactly the same size and shape as the USB sticks with press materials at nearly every other booth, and I was distracted by the conversation. But when the guy who handed it to me put on his “I am having a heart attack right now” face, that brought me back to Earth rather quickly. 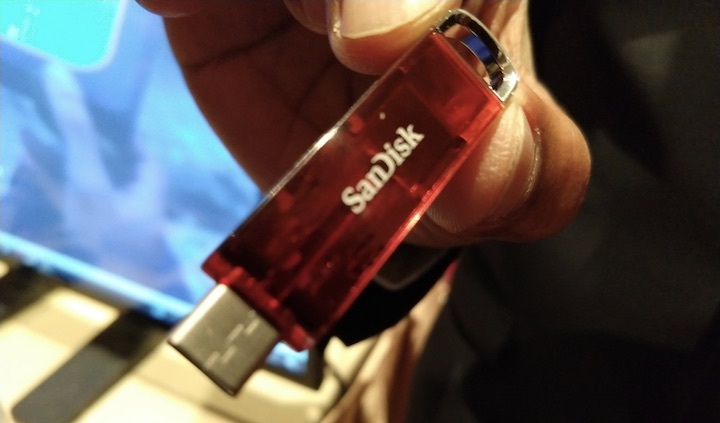 Western Digital Storage — Western Digital’s SanDisk brand gets to go first, as it was the prototype I nearly walked off with. That was a 1 TB SSD with a USB-C connector, no larger than a standard USB stick. No details regarding release dates or price are available yet. 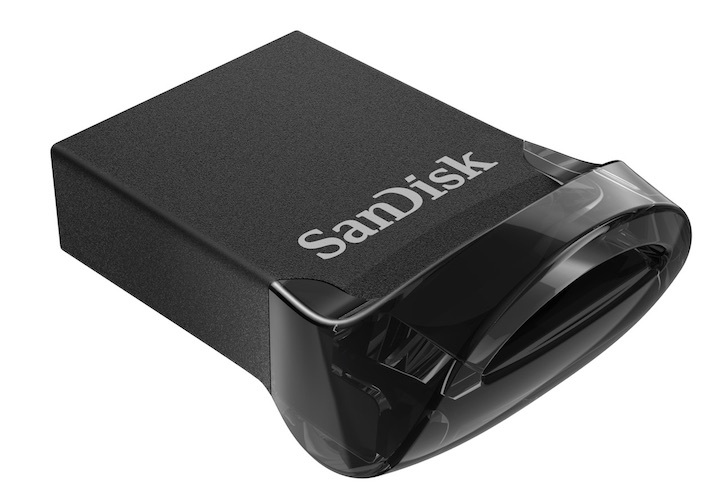 However, SanDisk is shipping the Ultra Fit 3.1, a tiny USB-A drive which sits nearly flush with your port; sizes range from 16 to 256 GB, priced from $22 to $150. This flash drive is literally smaller than a quarter. Anker — At the moment I approached the Anker 🎁 booth, I was carrying one of Anker’s huge 20,000 mA batteries in my pocket, and charging my phone on the go. (I manage to forget to plug it in overnight at least twice a week.) The company’s line of batteries and chargers continues to receive incremental improvements, but their press materials neglect to mention what’s new and what’s not. At least I can report, from the booth conversation, that the 20,000 mA battery now outputs up to 30 watts, and they’ll be releasing a portable charger in Q3 2018 with two USB-C and two USB-A ports, as opposed to the 1-and-3 version out now. Anker also announced the Zolo+ earbuds, available later this month, but at only 3.5 hours of battery life and a price point of $149, the only standout feature is a toggle that lets you filter ambient sound. 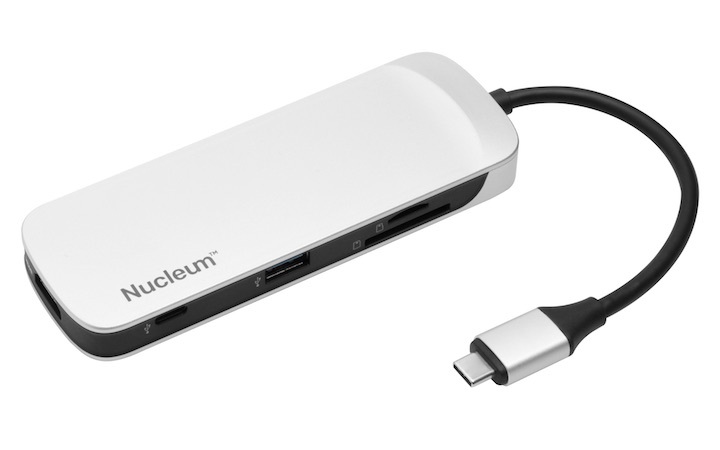 Kingston Nucleum USB-C Hub — Kingston released the Nucleum USB-C hub, which connects USB-C MacBooks to seven different ports in a small and attractive package. Notably, Kingston touts advanced engineering in the hub to make things work right: passthrough power is allocated evenly, even when every port is in use; HDMI output is 4K; and USB ports are designed to reduce electromagnetic interference that could affect Wi-Fi signals and vice-versa. About the only drawback to the design, to my eye, is that the USB-C cable that connects to the MacBook is stiff and hardwired to the Nucleum, which means it’ll take up a bit more room in your go bag. $80 from Kingston’s site, available now. Acronis True Image for Mac — You might be familiar with cloud backup services such as TidBITS sponsor Backblaze, which Joe Kissell recommended after CrashPlan pulled the plug (see “CrashPlan Discontinues Consumer Backups,” 22 Aug 2017). Backblaze runs on an all-you-can-eat model — you pay by the computer, and Backblaze doesn’t care how many terabytes you have attached to it. Acronis True Image for Mac is different. Acronis sells a standalone app for local backups and two metered cloud services that offer additional value-added services. In August 2017, Acronis 🎁 added ransomware protection to their cloud backup. In the event you get attacked by someone demanding Bitcoin to decrypt your files, Acronis will detect the attack and keep copies of the files before they were affected. A standard cloud backup without this protection would likely overwrite the cloud backup with the encrypted files you can’t open. Also in the mix: backup of iOS devices and the option to use network-attached storage (NAS) as your backup target for local backups. Pricing comes in three flavors: Standard is a $50 license that’s good forever, but only for local backups; Advanced costs $50 per year for 250 GB of cloud storage and various cloud-related features; and Premium runs $100 per year for 1 TB of storage plus additional cloud features. You can add additional storage to any cloud plan. 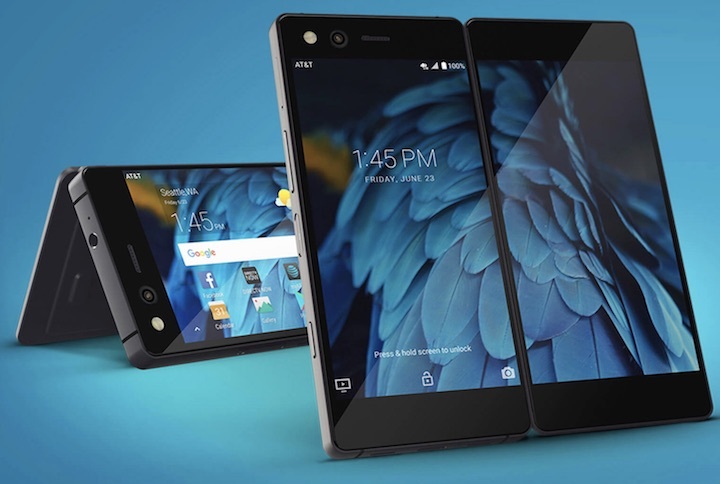 ZTE Axon M Dual-Screen Phone — Most of you won’t care about anything Android, but still, the fold-out dual screen on the ZTE Axon M has a wow factor worth mentioning. I was wondering how useful it would be, since almost no Android apps will be coded to understand a 6.75-inch square screen with an air gap in the middle. ZTE has thought of this; the phone can natively run one app on each side. It’s only available on AT&T, and costs $24.17 per month for 30 months (and only if you keep AT&T service). It’s been shipping since October 2017. SquareTrade Device Protection Plans — AppleCare+ is the default way to insure your Apple gizmos against unfortunate interactions with the sidewalk, but it has its drawbacks. The biggest one is that if you miss your window to buy it while you’re still under warranty, you can’t have it. If you’re insuring an iPhone X, AppleCare+ is also kinda spendy. SquareTrade 🎁 (a division of Allstate) will insure your iPhone, no matter which model, for $129 for 2 years, with a $99 deductible for most damage, but only $25 for shattered screens or back glass. Even better: later this year, in some service areas, SquareTrade will send a repair guy to you to fix the screen on site. SquareTrade also has plans for MacBooks and iPads, as well as for a laundry list of other electronics. My 2016 MacBook Pro would cost $240 for 2 years (with a $75 deductible), and my iPad Air 2 would set me back $109 ($49 deductible). No need to still be under warranty when you sign up, but you have to prove that the device works. 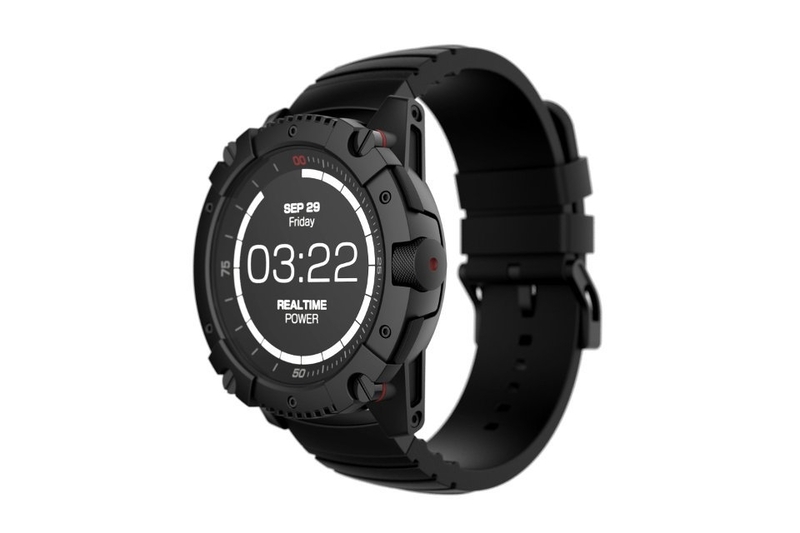 Matrix PowerWatch X — At $249 later this quarter, the PowerWatch X seems overpriced for what’s essentially a fitness watch with notifications from your phone, but it has two killer features. First, it’s water resistant to a depth of 200 meters for you divers. Second, you never need to charge it. It converts your body heat into all the power it needs. Did you know that at rest, you radiate 100 watts of body heat? Granted, that’s not all in the wrist, but I gather the watch doesn’t need all that much. The currently available regular PowerWatch has nearly the same specs for $199, but it doesn’t pick up phone notifications. Note: this thing is huge compared to my Pebble Time Round. LimeBike Bicycle Rentals — Bicycle rentals have become a big thing in major cities, but expansion to new cities can be slow. Bikes have to be locked into docking stations when they’re picked up and returned, and the programs require regulatory approval and capital investment. LimeBikes are different; they have built-in locks and are locatable by GPS, so they don’t need docks. When you’re done with it, just leave it on the sidewalk or on a public rack; the next person will be directed to it by their phone’s app. I asked how the technology prevents theft, and it turns out that a locked bike that gets moved more than a few feet sets off a loud alarm and phones the mothership. Since nothing needs to be built, LimeBike can expand to your city or college campus easily. Check their site to see if they’re in your area, and if not, sign up to be a plus-one in your area to convince them to go there. Newly announced at CES were bikes with assistive electric motors, but these are starting out this month only in Seattle, San Francisco, and Miami. Human-powered bikes cost $1 for 30 minutes; the electric ones will cost $1 every 10 minutes, plus a $1 unlock fee. 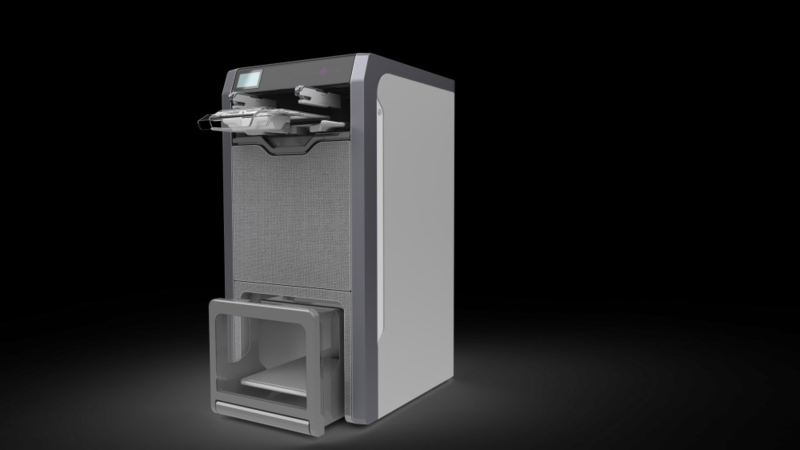 Foldimate Laundry Folding Machine, Again — I covered the announcement of Foldimate last year (see “CES 2017: From Laundry to Play-Doh at Showstoppers,” 9 Jan 2017), because it made my list of ludicrous things that might amuse TidBITS readers. Back then, you had to lay each item flat on a rack and put it in the machine; it wasn’t any easier or faster than folding clothes yourself. It’s a year later, the shipping date has slipped and is still 2 years away, and the price has risen to $980. On the other hand, on the redesigned model, you just clip an item of clothing to the top of the machine, it rolls in, and out it pops folded at the bottom. Foldimate estimates you’ll fold around 10 items a minute, which is faster than I can fold on my own. The company is taking pre-orders, but late 2019 is still pretty far away. I can use the following method to fold more than ten shirts in a minute. Each shirt takes only 2-3 seconds, with another 2-3 seconds just to move to the next shirt. I'm on my phone and can't watch that video (for less than a buck, anyway), but yes, I linked something similar in last year's review. My estimation is that at this point, the Foldimate has been upgraded to "theoretically useful, but expensive and not available for a long time." Stop promoting the leave anywhere free bikes. They are a nuisance as they are left everywhere and not collected. People in my city hate them so much that they throw them in lakes, ponds, dumps, up trees and other creative places. I'm surprised to hear that they're so disliked. From Jeff's description of LimeBike's system, they probably wouldn't suffer the same fate, given that locked bikes have alarms if they're moved too far. Your point about where they're left is a good one though — just dumping a bike against the side of a building or in the middle of a sidewalk would be annoying. Alarm doesn't mean much if there's a handy body of water to throw the bike into. Cities and China have already experienced an incredible boom and bust of dockless bike rentals. Leave the bikes anywhere but a proper bike-locking spot and you're basically littering. Leave them at a proper bike-locking spot and they could consume too much space, not leaving room for bike-owners to lock up. You can't bring them indoors, that denies access for others to rent them. I don't know that any American city has enough infrastructure to really support this model. Every block should have a car parking space converted to a bike parking spacer owned and rented ones, popular destinations would naturally need more. Any money guess the correspondent is from Australia. There has been a small group of people who are vandalising these bikes for no reason other than they are 'annoying'. Its a first world problem when there are virtually free, good quality bikes (with helmets) left for people to use to combat traffic in our cities... and some people get really angry and vandalise them because they are 'just left anywhere' for others to use. I watched an old guy cutting the brake cable of such a bike for no reason other than he could. Some people are just going to hate! When the business folds here due to these vandals, they will be outraged about the traffic congestion again. LimeBike has set rules for legal parking spaces, and will drop you from the service if you ignore warnings that you've parked illegally. San Disk Ultra Fit 3.1 USB-A drive is slightly disappointing with USB 3.1 gen 1( 5 Gbps ) instead of gen 2( 10 Gbps ). You'd hope San Disk would at least have gen 2 given it was available back in the 2013/14 timeframe. Also USB 3.2 was announced in July 2017. Doesn't seem like the leading edge product I'd expect to see at CES. gen 2 is unimportant for such a drive; it's highly unlikely that the media inside is fast enough to saturate even the 5Gbps connection.